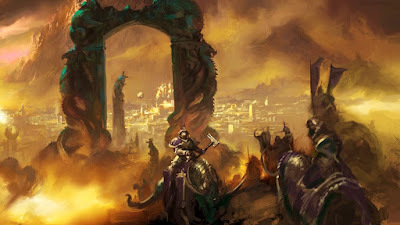 Out of all of the aelf factions, I would have to say the two that got the most love from the community and gamers out there were the Daughters of Khaine and the Phoenix Temple. Something about the stoic aelves and their majestic birds just called out to people. Today I take an in depth look at the Phoenix Temple and all of its warscrolls. When the aelf factions were divided up a few fared better then others. Daughters of Khaine, Order Serpentis, Darkling Covens, Order Draconis, and Phoenix Temple came out on the other end as still playable, with enough unit choice and internal synergy to make them fun. 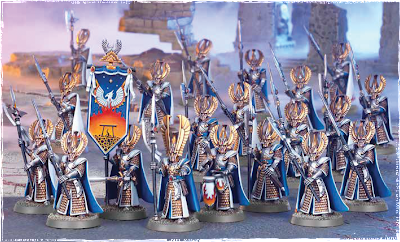 Daughters have of course gotten their own Battletome now, and Covens got allegiance abilities in the General's Handbook 2018, but for some reason, the Phoenix Temple still stay near the top when people start an army of pointy ears. Is it their imagery, their immovable infantry, the giant birds, or a combination of the three that make them standout? I'll start out by taking a look at the individual warscrolls. 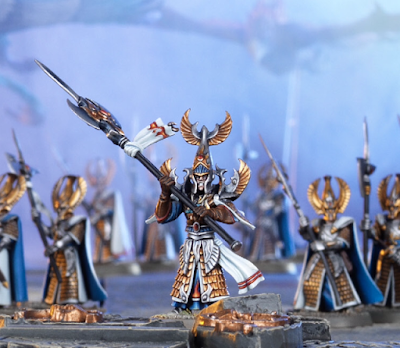 The staple of the army is the Phoenix Guard, a unit of extremely hard to budge aelves who can dish it back out too. 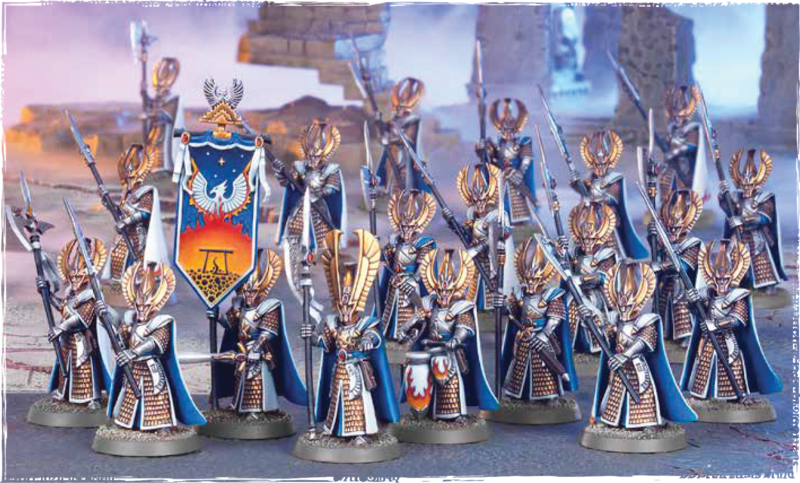 Battleline in a pure Phoenix Temple army, you're sure to see at the very least 30 of these guys, probably more too. They're fairly quick with a 6" move, which is only right for an aelf, but are extremely durable. They only have 1 wound a piece, but they come with a 4+ save and the Witness to Destiny rule which allows them to roll a dice for each wound or mortal wound suffered and ignore it on a 4+. That is definitely one of the best, if not THE best ignore wound roll in the game. They're also bravery 7 with at least an additional point of bravery from their banner, probably two. That's of they're not within 8" of any Phoenix Temple heroes, in which case they're immune to battleshock all together. This has the double bonus of making the Phoenix Guard hard to budge and freeing up your general to use their command ability instead of Inspiring Presence. Even if you dish out the wounds to this unit, chances are you won't kill that many, and then on top of that, they won't lose many or any models to battleshock. Having faced these guys on the table, be prepared to spend several turns chewing through them. They each then get 2 attacks back hitting on 3s and wounding on 3s. That's also with a 2" reach, and since they're fighting on 25mm bases, that means fighting in up to three ranks. If you had a full unit of 30 of them they would most likely all be in range, meaning you're dealing with 60 attacks coming back at you! There's no rend and only 1 damage, but with that amount of attacks and their reliability to hit and wound, I don't think they'd have much of a problem dealing with most foes. 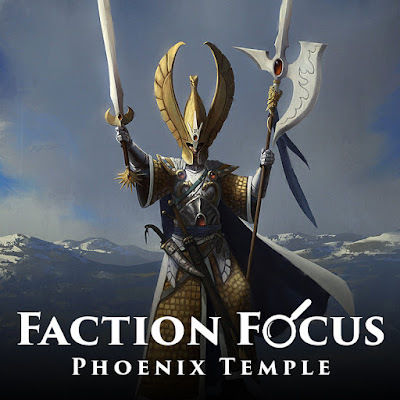 If you're playing Phoenix Temple the Guard are great objective holders and can also fulfill a main assault role, just expect it to be a bit of a slow assault. Like a steamroller slowly grinding through anything in front of it. At 160 points they're a tad pricey, but definitely worth it. They even have a massive regiment discount if you take them at their full strength of 30. I would definitely at least have one full strength unit in your army. If you're playing against these guys I would try and throw disposable units in their way to tie them up or avoid them as much as you can and play to the scenario. You definitely don't want any of your good stuff getting bogged down in them. Now personally, I'm not a huge fan of the models. They're a bit too static for me, and the wings on their helmets are huge. That being said, they are by no means bad and are a newer kit from 8th edition, so they shouldn't have a ton of mould lines or anything. They look like they can be fairly quick to paint too, with just a few main areas of color. The scale armor lends itself to washes and dry brushing as well. Their capes also allow more experience players to really flex their painting muscles if they went with freehand too. Now we're getting into the units the faction is named for. With only one infantry unit, expect to see a few of the Frostheart and Flamespyre Phoenixes fleshing out the ranks. Each of these models can also have an Anointed mounted on top of them, but I'll go over him more in his own entry, since he's pretty much the same across all of them. With 12 wounds and a 5+ save, this guy is no slouch. He even has 8 attacks at full wounds, hitting on 3s, wounding on 3s, with 1 rend and 2 damage. That's a potential of 16 wounds if you're really lucky and your opponent is really unlucky. While they're good in combat, that's not what they're most used for. Their special rule, Blizzard Aura, starts out with a range of 9" and any enemy models within that must subtract 1 from their wound rolls. (Correction: I mistakenly said this ability stacked, it does not.) This aura shrinks pretty rapidly once they reach half wounds, but the aura itself should help keep them alive. Considering they can fly and start out with a 16" move you can get these birds to exactly where you want them too. I would fly these guys up alongside your main blocks of Phoenix Guard, making them even more survivable, or alongside some combat heavy allies. The Attuned to Magic special rules makes them even more survivable. If anyone within 12" casts a spell at all, even if it's dispelled, their save increases by 1 until your next hero phase. Most people will take this with an Anointed mounted on it, which makes sense since it's the same points cost anyway. This gives you the Witness to Destiny rule, meaning your bird now gets a 4+ save against any wounds or mortal wounds suffered, as well as the halberd attacks and command ability from the hero. You'll probably want at least two of these in your list and if you're playing against this army these should be your priority target. These can be pretty quick to paint, but I've also seen some fairly elaborate paint jobs as well. Spray them white and use some blue washes and glazes with a little dry brushing though and you can knock it out pretty quickly. The Flamespyre Phoenix is pretty similar to its frosty cousin. It has all of the same stats, the same attacks, and the same amount of wounds. It even has the same Attuned to Magic special rule. The big difference though comes in its other special rule. Instead of the Blizzard Aura rule it has the Phoenix Reborn and Wake of Fire rules. Phoenix Reborn allows you to roll a dice in the hero phase following the death of the Phoenix. On a 4+ it is reborn with all of its wounds returned and can be set up anywhere on the table more than 9" from the enemy. This is very in keeping with the Phoenix mythology and is a really cool and powerful rule. The only problem is that in Matched Play you would need to set aside reinforcement points to do this, and it's not a guaranteed thing. You would be better off just paying for a second Phoenix to start on the board. Wake of Fire allows you to pick one unit you flew over in the movement phase and do D6 mortal wounds! The number of wounds it inflicts goes down as it gets wounded. This is pretty good, but also really swingy, since you could potentially roll a 1. Just like the Frostheart, it's decent in combat, but not spectacular. You can also mount an Anointed on it as well, but in the end I just don't see why you would pick this version over the Frostheart. The Frostheart is way more survivable, and gives benefits to the rest of your army. The Flamespyre is just a damage dealer, and can be either pretty good at that, or just meh. I love the idea of a flaming phoenix though, so would still love to see them included in the army, though it would definitely be the third phoenix to be taken after two Frosthearts. If you're trying to be really competitive as well you're probably better off just not taking it and spending the points elsewhere. Just like the Frostheart this can either be fairly quick and easy to paint or you can really take your time on it. I think it would make a wonderful centerpiece to the army. So the Anointed is an option you can take on foot for 80 points, which has 5 wounds and a 4+ save. The foot version also has an ability called the Blessing of the Ur-Phoenix, which allows him to unbind one spell a turn just like a wizard. Everything else about him is the same across the foot and mounted versions. He has 4 attacks with -1 rend and 1 damage, which is okay, but not much when compared to the Phoenix Guard. In addition to the Phoenix attacks when he's mounted though it's a nice little damage buff. He also has the Witness to Destiny rule, giving him the 4+ save against any wound or mortal wound. His big rule though is the Captain of the Phoenix Guard command ability. When you use this all Phoenix Temple units within 8" of him can re-roll all failed to wound rolls. That's pretty massive and make your Guard even more reliable. When mounted on a Phoenix with an even larger base your radius on this ability will be pretty big. Since the Anointed is the only hero in the army, you'll definitely be taking him. Honestly, you'll probably be taking him mounted on a Phoenix the majority of the time. I can see taking him on foot in smaller games, or as a support hero to help keep your Guard from taking battleshock tests. He's okay in combat, but his command ability is his real worth. 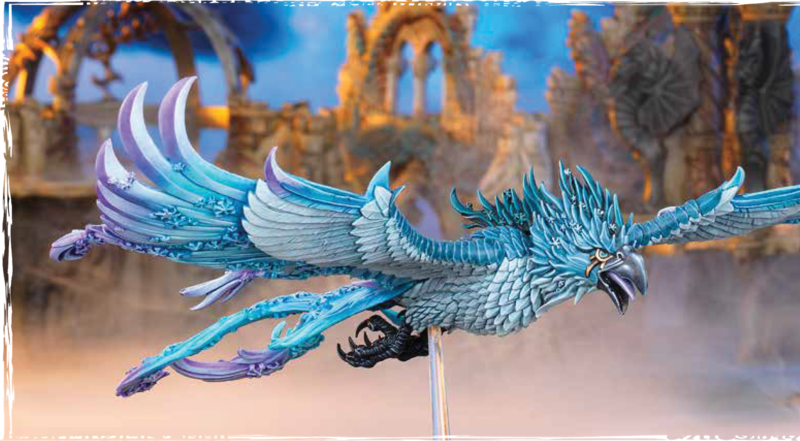 I expect to see one mounted on a Frostheart as the general in most Phoenix Temple armies. 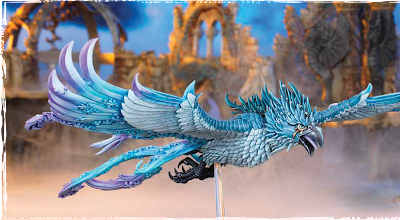 The Phoenix kit comes with both a mounted and foot version of the model in plastic, but if you're taking one on foot I would probably use the old special character model, Caradryan, who's still sold as a regular Anointed. It's just a much more interesting model in my opinion. 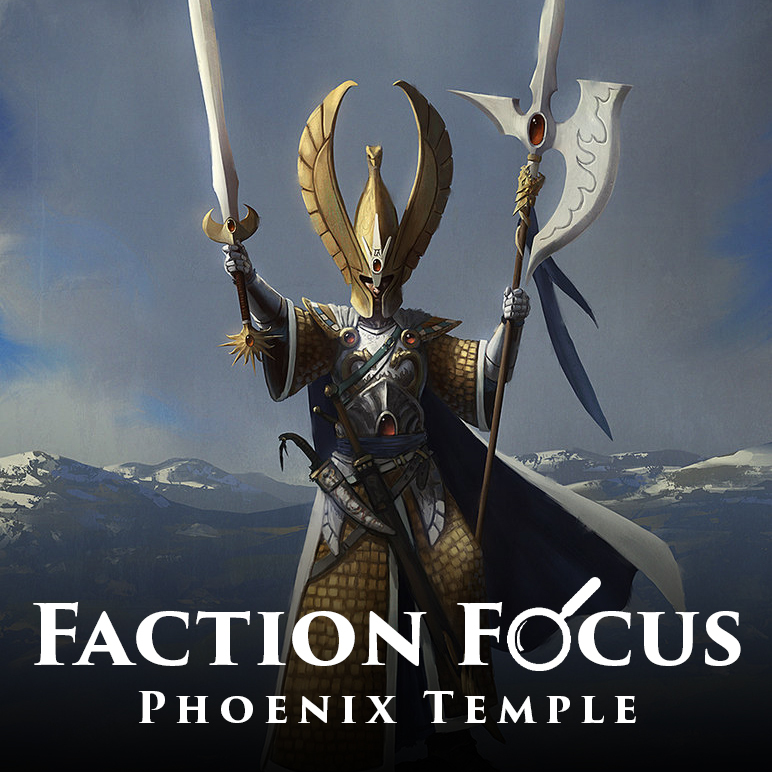 The Phoenix Temple is one of the few factions that got a Warscroll Battalion when the Grand Alliances were released. It requires you to take 2-4 Frostheart or Flamespyre Phoenixes, 1 Anointed, and 2 units of Phoenix Guard. The buff you gain is a rule called Elemental Nova. In your hero phase you pick one enemy unit and roll a dice for each Phoenix within 9" of them and on a 4+ you do D3 mortal wounds. It's okay, but not great. The big downfall to this though is that you have to take the unmounted Phoenixes and the Anointed on foot since none of the unit entries are bolded. If they were bolded that meant it was Keyword based and you could have taken any version, but since it's not you have to go by unit name. Like I mentioned before, you're most likely to see Phoenixes with Anointed on them over the other versions, because of this I doubt you'll see many people playing this battalion. When it comes to what allies to take, I would probably lean towards a wizard of some kind or a dragon. In a 2,000 point game you're able to take both a Drakeseer and a Loremaster. This gives you two wizards, a dragon that can dish out damage, and a Loremaster to make that dragon truly deadly. You also have access to all of the Stormcast stuff, so a little bit of ranged firepower wouldn't go amiss either. The background for the Phoenix Temple in AoS is fairly sparse, but this just leaves it open for you to flex your creative muscles. They worship the Ur-Phoenix, and have temples in most of the free cities of Sigmar. In fact, there is the city of Phoenicium, a city within Ghyran which is home to a massive collection of the Phoenix Temple forces. 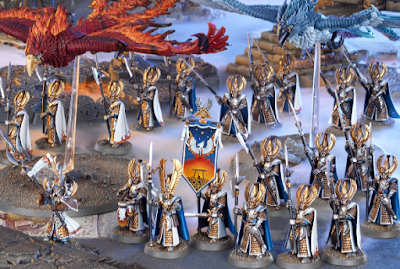 If we carry over a few things from 8th edition that are hinted at in the Age of Sigmar lore, we can assume that the Phoenix Guard have also taken an oath of silence. The easiest way to tailor this force to your own lore would be to set them within a city of your choosing. They can even take the Firestorm city allegiances on top of the generic Order ones. 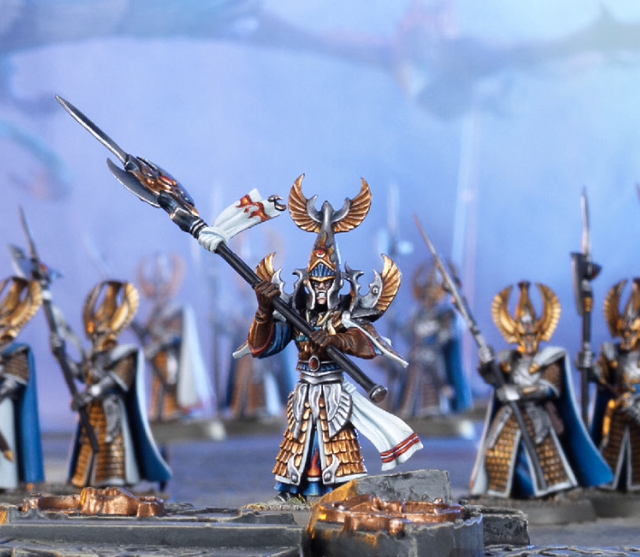 You can obviously use the rules for Phoenicium, which would be very fitting, but I actually think Anvilguard or Tempest's Eye work better for the army. Anvilguard is one a lot of people are drawn to, but Tempest's Eye would greatly increase your movement and survivability even more. Just be careful, taking a city's allegiance limits what allies you can take. What are your thoughts on the Phoenix Temple? Every time I write one of these articles I have to stop myself from starting the army. These guys seem like a great choice for a Start Collecting box at some point in the future. One unit of Phoenix Guard, a Phoenix, and an Anointed on foot. I always struggle to start writing these articles because they're a bit intimidating to start, but I find them a ton of fun to work on once I get going. Which faction would you like to see covered next time?